French Revolution (1789-1799) - The absolute monarchy of France came tumbling down in a big way during the final decade of the 18th century. A combination of economic hardship and the success of the American Revolution inspired French citizens to rise up against their governing powers. Throw in a dash of Enlightenment thinking, and it became a full-blown revolution. However, in the end, it had a very different outcome than its American counterpart. Recall that the American Revolution was initiated by a series of taxes imposed on the colonists by the British government as a result of the debt incurred during the Seven Years' War. Well, considering that England was at war with France, the French people had to contend with the same issues. In fact, they were being asked to fund two wars, the Seven Years' and the American Revolution, which France had entered in 1778. On top of that, a series of bad harvests in the 1780s led to widespread famine in France which exacerbated the hardship. When Louis XVI became king in 1774, France was already deeply in debt. He hired a number of ministers to restore financial health to the national treasury, but all their proposals were rejected. Mainly because the proposals involved eliminating tax exemptions for the aristocracy and clergy which helped to make them wealthy. With a deepening debt crisis and growing unrest among the people, King Louis had no choice but to convene the Estates-General in 1789, something that had not happened since 1614. The Estates-General differed from other assemblies (such as the Assembly of Notables) in that it included representatives from the Third Estate (common citizens). The First Estate consisted of the clergy and the Second Estate of the aristocracy. However, the assembly ultimately failed because it could not agree on how to divide representation. The citizens wanted it divided by population, of which it made up 95%. But the clergy and nobles, which consisted of only 5% of the population, wanted each estate to receive equal representation (what a surprise). It was clear that the commoners weren't going to get anywhere so long as the clergy and nobles so fiercely guarded their interests. So in July 1789, they took matters into their own hands by storming the Bastille, one of the most famous moments of the entire revolution. The violence forced Louis to relent and he formed the National Constituent Assembly which passed a number of reforms; the abolition of feudalism and the Declaration of the Rights of Man. However, change came too slowly and the lives of French citizens failed to improve in any significant way. By 1791, Louis feared the monarchy was in trouble and, along with his wife Marie Antoinette (and other family members) attempted to flee France. They were headed for Austrian territory, where Marie's brother, Leopold II, was king. But they were caught at Varennes, arrested and brought back to Paris. In fact, the National Assembly was in the process of drafting France's first constitution which called for the establishment of a constitutional monarchy. The king would continue to rule, but under the auspices of a legislative body. However, in the chaos created by the destabilization of the government, other factions arose which had their own ideas on how best to run France. The one which acquired the most power was the Society of the Friends of the Constitution, or the Jacobin Club, or simply the Jacobins, as they became known. As it turned out, they were the most radical group as well, and had plans to overhaul not just the French government, but all of French society. Their first step was to abolish the monarchy. Louis XVI was tried, convicted and executed. 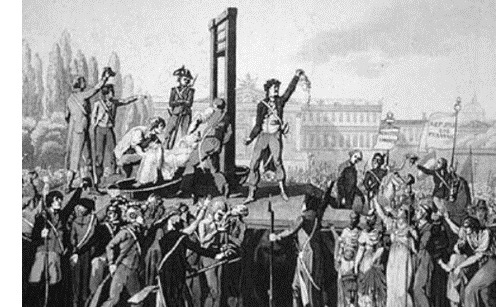 The method of execution was the guillotine, which would become known as the "National Razor". He was beheaded on January 21, 1793, and Marie Antoinette would follow in October. Louis' death launched what became known as the Reign of Terror, a year long period of almost constant executions; about 25,000 across France, all done under the authority of the Jacobins. Initially, they operated within the National Assembly, but as their power grew, the Jacobins began making changes. They dissolved the National Assembly and set-up the Committee of Public Safety, which virtually ran the country. There were several prominent leaders within the Jacobin Club. Jean-Paul Marat was a journalist known for his fiery rhetoric. Georges Danton became president of the Committee of Public Safety. But the most famous leader, the one who is the face of the French Revolution, was Maximilien Robespierre. Robespierre actually began with noble intentions. He rose through the ranks from the very bottom of the political ladder. A lawyer from Arras, heavily influenced by thinkers of the Enlightenment, particularly Rousseau, who became a representative of the Third Estate during the Estates-General of 1789. From there he moved to the National Assembly where he frequently gave speeches voicing his opinion on the rights of the people. Finally, as the Jacobins rose to power, he was drawn to their desire to effect change rapidly, and they, in turn, were drawn to his charisma. In a very short time, he had become the most powerful member of the party. But the Jacobins quickly compromised their beliefs in order to build the society they envisioned. For example, Robespierre was firmly against the death penalty. He viewed it as a form of intimidation which the king used in order to instill fear into his subjects. And yet, as opposition toward Robespierre grew, he himself resorted to the guillotine in order to remove that opposition, which he viewed as an obstacle to his plans for an ideal society. In the end, the Jacobins created a legacy of bloodshed. It eventually consumed even their own party, and the revolution only came to an end with the deaths of their leaders. Jean-Paul Marat was assassinated while taking a bath. Danton was executed with the consent of Robespierre himself. The two had become adversaries as the revolution progressed. Danton's final words to the crowd were, "My only regret is that I am going before that rat Robespierre!" (However, his last words to anyone were to the executioner. He said, "Don't forget to show my head to the crowd. It's well worth seeing."). And finally Robespierre himself was executed on July 28, 1794 when the people had finally had enough of the Jacobins and their bloodbath. With the death of Robespierre and with no king in power, a political vacuum was created which was eventually filled by a military general named Napoleon Bonaparte. 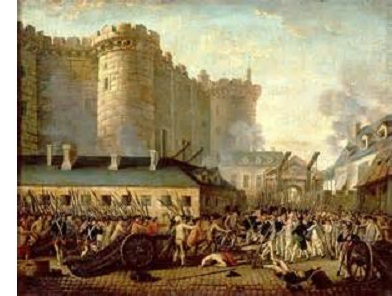 Though inspired by the American Revolution, the French Revolution was not nearly as clean as its American counterpart. It may have begun as a movement for peoples' rights, but it ended as a massacre soaked in blood that led to the execution of...well, just about everyone.